Posted on September 7, 2011	by Linda S.
Years ago as a young stay at home mother, with only one income for the family, there wasn’t much money for those little gadgets. So I was taught to make them using only my fingers, yarn and a pair of scissors. 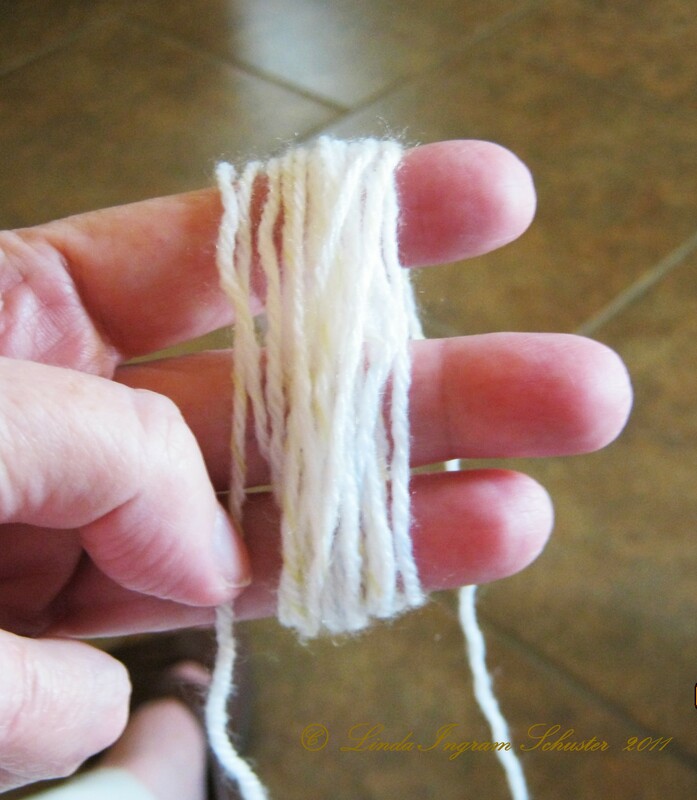 First… cut a piece of your yarn/string about 7 to 8 inches long and lay aside. Begin by wrapping the yarn around your 3 middle fingers loosely. Continue to wrap until you have a pretty full “ball” on your fingers. 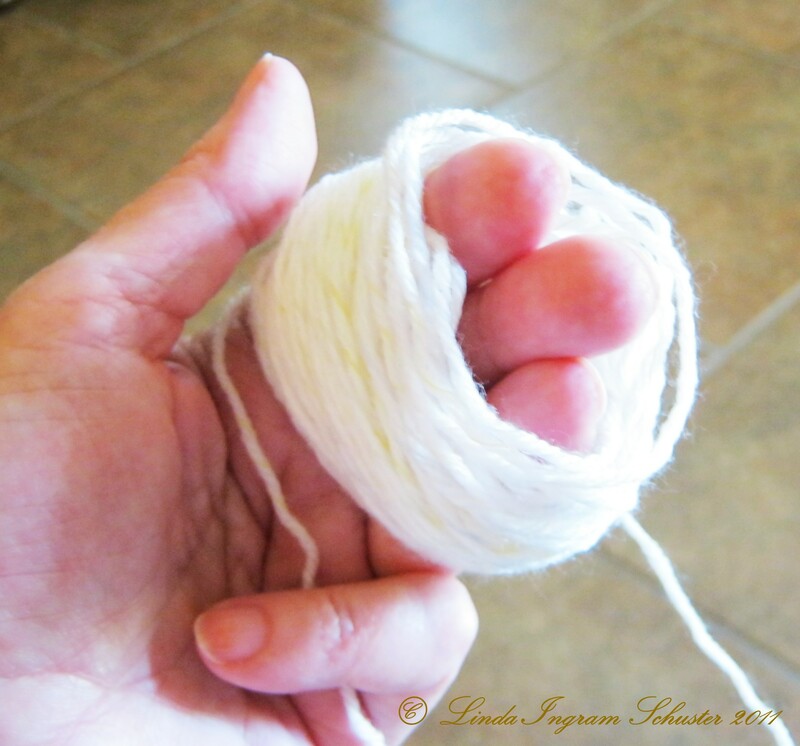 Slide the “ball” of yarn off your fingers gently .. keeping them aligned as closely as possible. 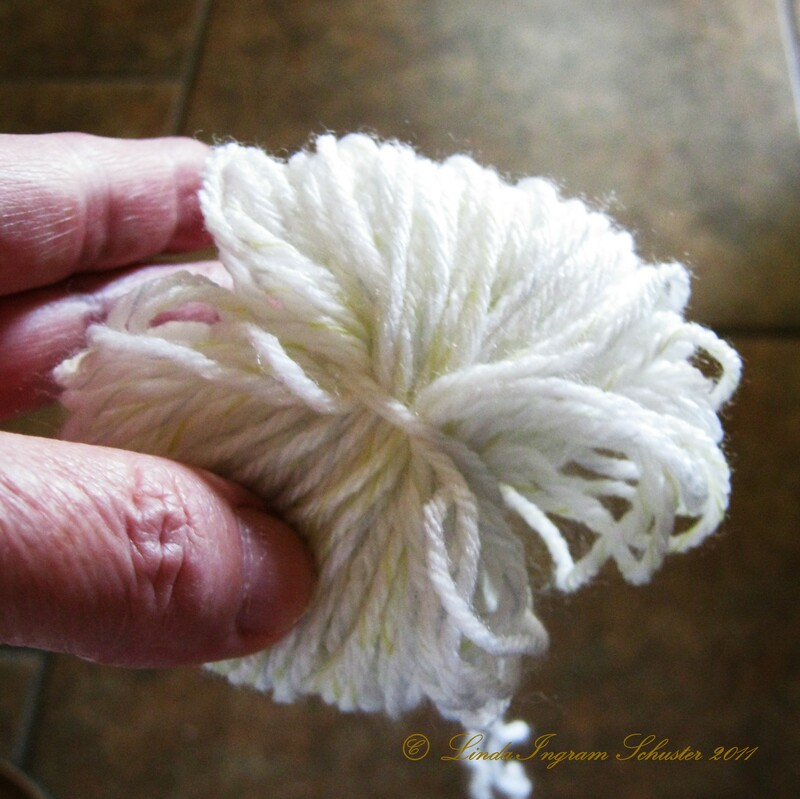 Using the piece of yarn/string that you cut earlier, wrap it around the center of the flattened “ball” and pull tightly… tie with a firm knot. It should look like this at this stage. Do not clip off the string you used to tie it with. 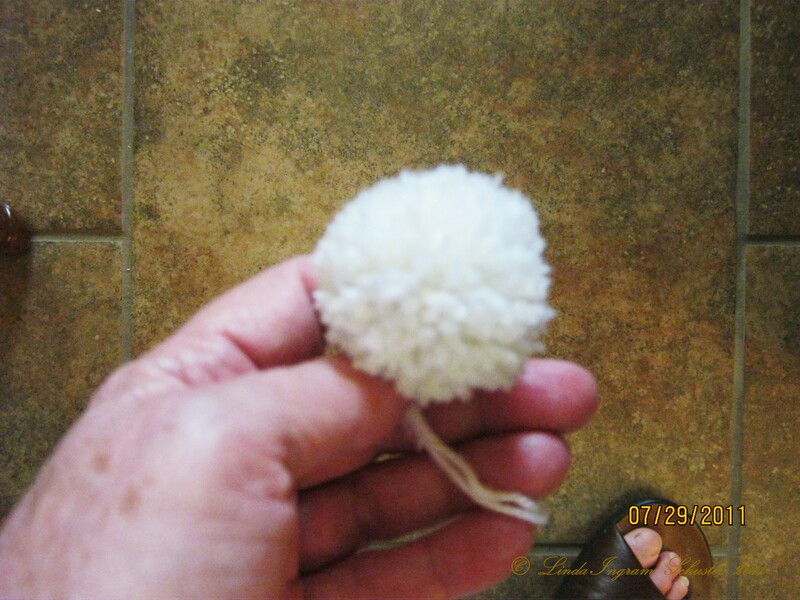 This will be used later to attach the pom pom to your project. 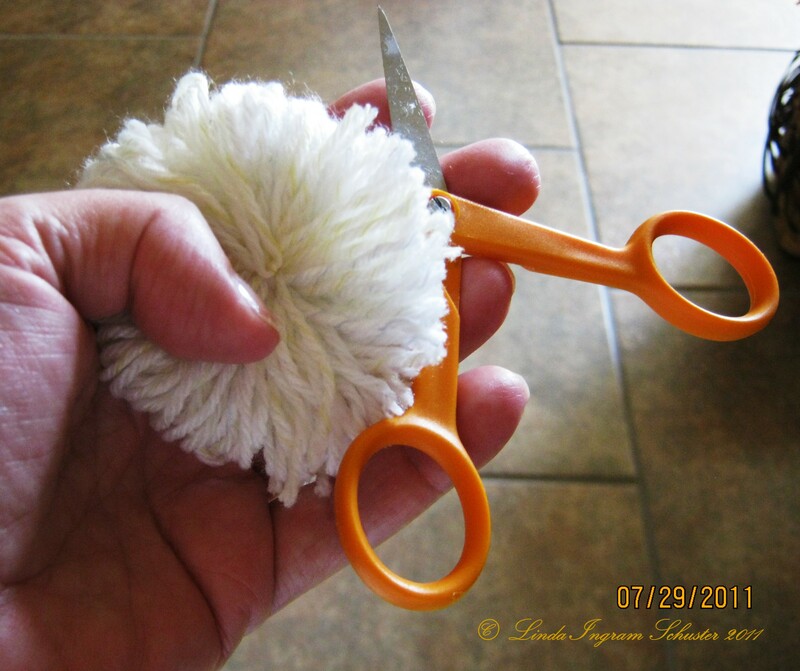 Using sharp-pointed scissors, slide the scissors into the loops formed when the “ball” was tied together and begin to clip them open… going completely around the circle. After going completely around you will find that there will be loops that have been missed. Go around again looking for those missed loops and be sure that you have cut them all. 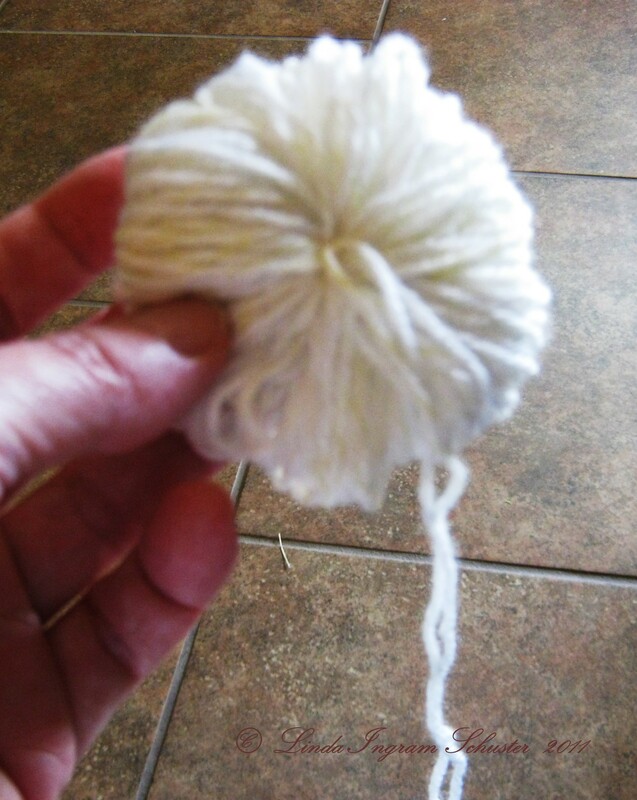 Holding the thread you will use to attach the pom pom with as closely to the ball as you can, begin to clip the pile into a round ball. Using the picture as a guide you can see that clipping will firm up the ball into a nice round shape. 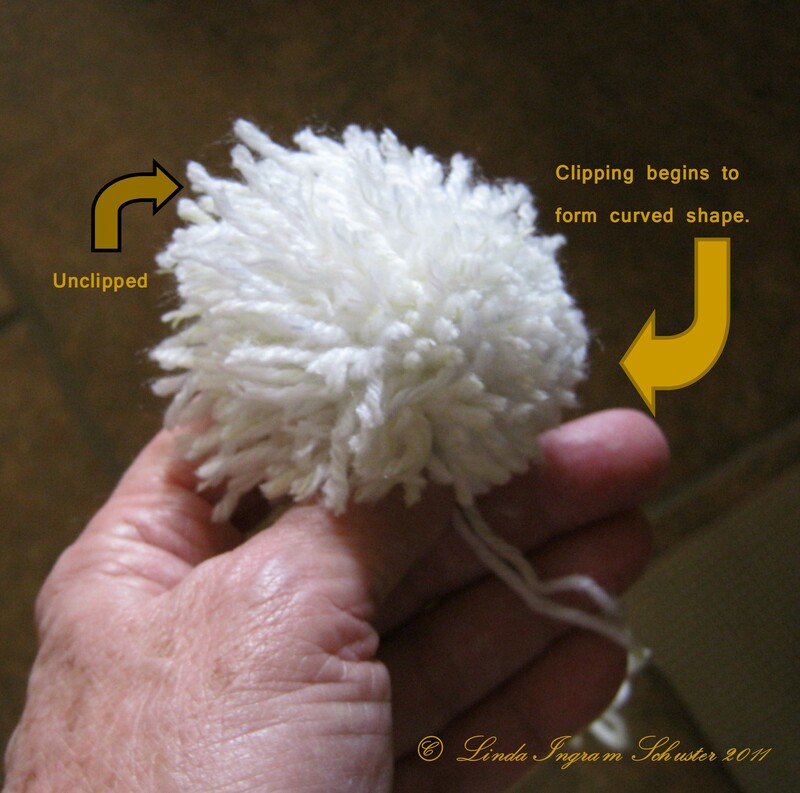 Continue clipping until the pom pom is in the shape of a ball. 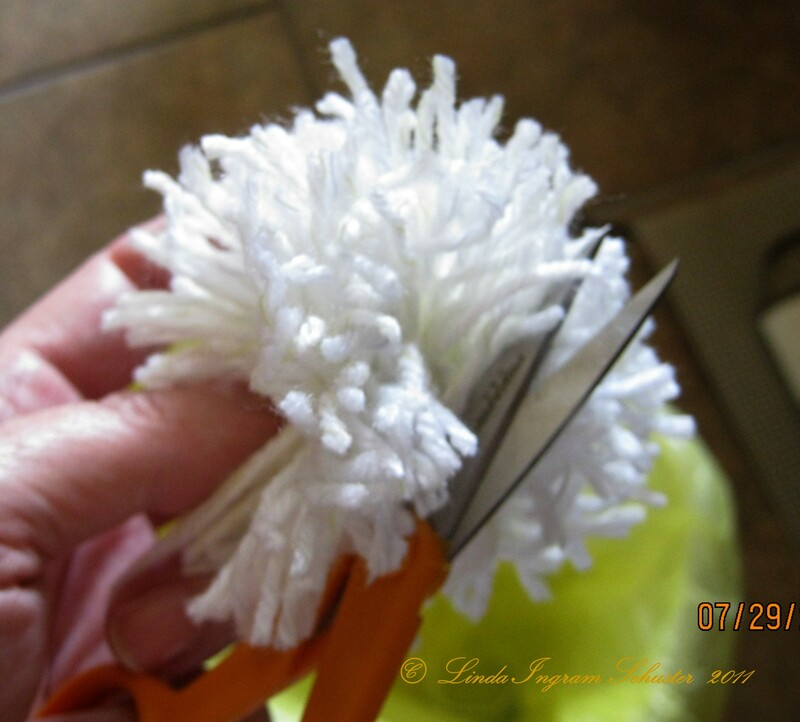 You will probably have made several “rounds”… clip the longer threads, fluff the ball to make any stragglers stand out, clip the stragglers then fluff again. In the end you will have a lovely little pom pom. This entry was posted in Free Patterns, Handcraft, Handwork, Historical Textile, Tutorials. Bookmark the permalink. Great tutorial! Thanks. I’m making some pom poms that I hope to clip on to a beret to convert it to a pretend tam for my Scotch-Irish and French heritage.